Located on the East part of Lagos this superb Apartment located on the 2nd. and top floor of a small complex will give you all the luxury you want. This luxurious Apartment is located in Dunas Douradas (Golden Dunes) and enjoys an uninterrupted view to the Ocean and the whole of Meia Praia. The bloc only consists of 4 spacious units. This one is located on the 2nd.and top floor and is reached by elevator. The entrance hall gives access to the kitchen and dining room to the left and spacious lounge with terras to the right. Well furnished and fitted, the lounge has satellite tv and free wifi in the whole apartment.. The Apartment has 3 double bedrooms of which 1 en suite. There is a further bath (shower)room and a separate guest toilet. The property has access to a private roof terrace with sun loungers. Easy to park in front of the apartment and only 5 minutes walking distance to the beach. To the old historic centre of Lagos 15 min walk. Wij verbleven gedurende januari/ februari 4 weken in dit heerlijke appartement. Elke ochtend genieten van een ontbijtje op het balkon met uitzicht op zee. Het appartement is van alle gemakken voorzien , erg ruim en gezellig ingericht. Op loopafstand gezellige terrasjes bij de Marina en een grote supermarkt . Voor herhaling vatbaar. Spacious, very tastefully decorated and the kitchen provides for all the utensils, etc you could need. Five minutes' walk from a lovely beach. We really enjoyed our stay. Stayed here at the end of August and had a fantastic time. 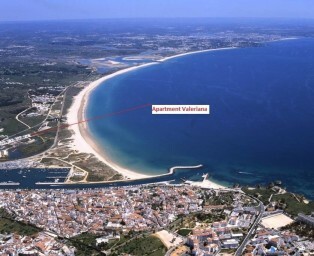 A lovely Apartmemt with everything you could need and an excellent location 5-10min walk to the beach. And what a beach! Meia Praia is not too busy, we got a sunlounger (€12) any day/time. Great for the kids to play, make sandcastles or play in the water. 15mins to the Supermarket (Pingo Doce) with great selection of food and cheaper than the Intermarche over the marina bridge. 10mins to the Marina and a wealth of boat trips to Dolphins, grottos etc. Another 10mins and you're in the centre of Lagos with lots of shops, restaurants etc. Must recommend the Mare restaurant above the fish market. What an excellent location over looking the marina and great food too. The tourist train stops at the Villa Gale so you can take this to the other beaches if you want to. One of the best holidays I have had in a while. Thanks to Caroline for assistance too. Tolle großzügig geschnittene Wohnung mit Meerblick!! Die Wohnung sieht wirklich aus, wie auf den Bildern und wir (Familie mit 3 größeren Kindern) haben uns sehr wohl gefühlt. Es ist das vorderste Haus mit direktem Meerblick und man ist in 5 Minuten Fußweg am feinsandigen Sandstrand. Die Küche ist sehr gut ausgestattet mit Geschirrspüler und sogar Waschmaschine. Supermärkte in 5 Minuten Autofahrt (Pingo Doce, Aldi, Lidl). Wir waren über Silvester hier und man musste allerdings sehr viel heizen, das es abends in der Wohnung kalt wurde. Es gibt in allen Räumen elektrische oder Gasheizungen. Wir würden sicherlich wieder kommen!!! Die Betten waren sehr bequem.